From 2012 to 2014 I contributed to The Grid, a weekly magazine/alt-paper which was known as eye for most of its existence. The publication folded in July 2014, with its web presence vanishing soon after. As some articles had already vaporized when I finally got around to collecting them for my records, some reprints will be based on original drafts. This installment of my “Ghost City”column was originally published on December 11, 2012. As plans to revamp the building have been released, it seemed appropriate to exhume this piece. Yonge Street looking north from Queen Street, early 20th century. 2 Queen West is the Knox store on the left. City of Toronto Archives, Fonds 1244, Item 495. During the last quarter of the 19th century, the intersection of Queen and Yonge was a battleground for clothiers and dry-goods merchants. While Eaton’s and Simpson’s wound up on the top of the heap, other merchants left their own marks, such as the building at the northwest corner named after men’s fashion provider Philip Jamieson. Toronto Star, October 20, 1900. Jamieson was en route from his native Scotland to Australia in 1873 when he visited his brother-in-law, Bartholomew Spain, in Toronto. Instead of continuing onto the land down under, Jamieson partnered with Spain in a clothing store on the current site of Old City Hall. By 1877, the partnership had dissolved, and Jamieson moved east to the corner of Yonge and Queen. Disaster struck just after midnight on March 4, 1895, when fire destroyed the recently built Simpson’s store across the street to the south. The blaze jumped north across Queen Street, destroying Jamieson’s store and its neighbours, except for Eaton’s, which was saved by its sprinkler system and swift-thinking employees who lived nearby. Despite $150,000 in property losses, Jamieson temporarily moved a few doors north on Yonge and vowed in his ads that “a magnificent building” would rise from the ashes. Designed by architects Samuel Curry and Francis S. Baker, the Jamieson Building, whose original address was 180 Yonge St., included a rounded corner and plenty of plate-glass windows at street level to showcase Jamieson’s goods. 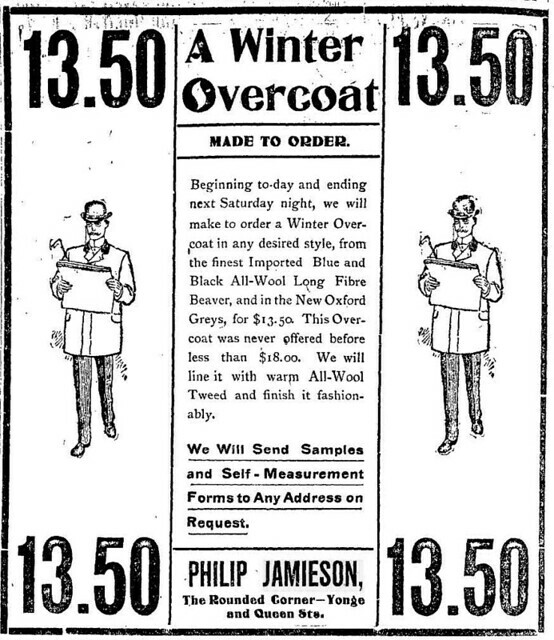 Toronto World, February 6, 1909. On April 30, 1897, the S.H. 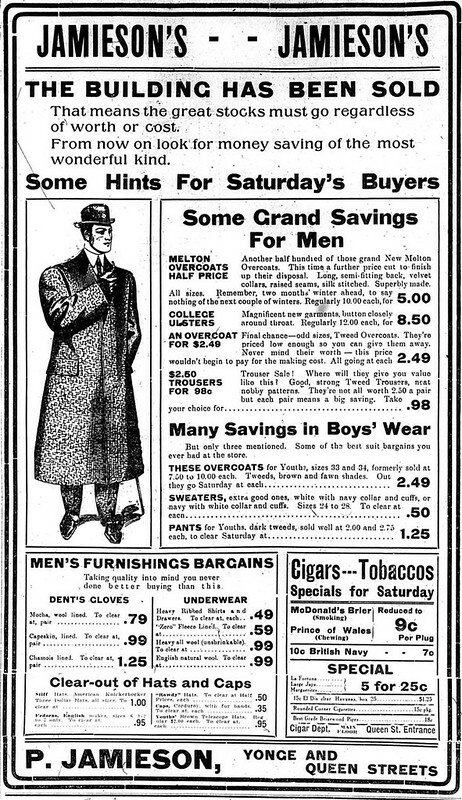 Knox Company opened its first Canadian five-and-dime store one door north. Owner Seymour Knox previously partnered with his cousin Frank Woolworth in the variety-store business south of the border, and continued to share suppliers when he set out on his own. Knox agreed to not build anywhere near the early Woolworth stores, making Toronto an attractive locale. (Knox’s heirs left their mark on the Buffalo area—Seymour II was involved with the Albright-Knox Art Gallery, while Seymour III and his brother Northrup established the Sabres hockey franchise.) In January 1909, Jamieson retired and Knox expanded into the space. Jamieson planned to travel around the world, but died the following month. The Knox nameplate remained until the chain merged with Woolworth’s in 1912. The Telegram, November 26, 1969. 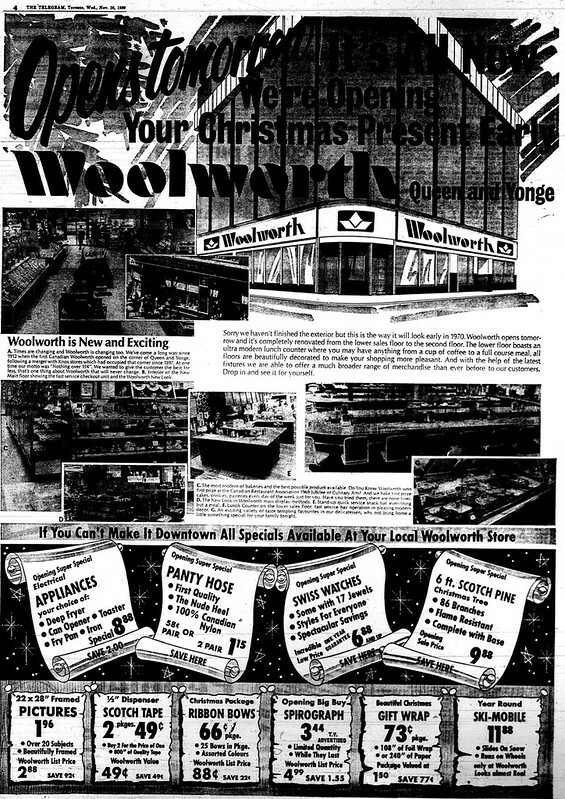 A succession of short-term retailers filled the space after Woolworth’s departed in 1980. When new owners purchased the site in 1985, they hired architect Lloyd Alter to design the restoration of the aging building. Alter referenced archival photos to glimpse what was buried under a layer of metal added by Woolworth’s. “I wanted to peel back the cladding like unwrapping a present,” Alter recalled in a recent email. Engineer Peter Sheffield devised an iron column up the middle of the barely-holding-together structure, to which three layers of plywood were bonded on each floor. While portions of the old brick were exposed, new blue-green aluminum cladding was added. The project experienced lengthy bureaucratic delays due to the owner’s decision to add a floor at the top for a fitness club (eventually the site of the Goodlife Fitness that vacated the building last year), which made it difficult to meet environmental load requirements. The frustration surrounding the project led Alter to change careers from architect to developer. As for how he could have handled it differently, Alter says that he “would have restored the prism glass and the whole ground plane to the way it was and figured out how to expose the iron-cast columns.” He would have treated the south section as “a real restoration,” while the north half might have been replaced with a new tower. The Tower Records store that occupied the lower floors from 1995 to 2001 also experienced its share of frustrations. During its first Boxing Day, store managers asked Metro Toronto Police if they should open, given provincial regulations about closure that other retailers increasingly violated. “They laughed,” general manager Bob Zimmerman told Canadian Press, “and said, ‘We really can’t advise you, but you should probably take a look at your competition and do what they do.’” Tower angered Canadian publishers when they discovered the store broke federal guidelines by carrying American-distributed copies of Canadian books. Already edgy over rumours of American book chains eyeing the Canadian market, lawyers were dispatched and letters were written to the feds. Tower officials blamed a rushed store launch for the move, saying that they couldn’t find local wholesalers in time. The offending titles were pulled off the shelves and replaced with perfectly legal titles. When Tower departed, its space was quickly snapped up by the Forzani Group, who used it as a flagship location for its Coast Mountain Sports chain. The store was later switched to Forzani’s Atmosphere banner. Additional material from History of Toronto and County of York, Ontario Volume 1 (Toronto: C. Blackett Robinson, 1885); Remembering Woolworth’s by Karen Plunkett-Howell (New York: St. Martin’s Griffin, 2001); the March 4, 1895 and July 10, 1895 editions of the Globe; the February 1996 edition of Quill and Quire; and the March 4, 1895, February 9, 1909, February 10, 1977, January 3, 1986, September 26, 1987, and December 27, 1995 editions of the Toronto Star.